Normal working hours 7:00 a.m. - 3:30 p.m. 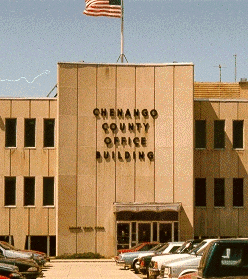 The Chenango County Department of Public Works is responsible for 308 centerline miles of roadways and 142 bridges within Chenango County. One of this department's responsibilities is to collect dead deer along any of our 308 miles of County roads. To report a dead deer, please call (607) 337-1715. The department does not collect any other animals. It takes between 3-31/2 hours to complete one snow and ice route. If you see a truck pass by your house at 6 a.m. you probably will not see that truck again until 9 or 9:30 a.m. There are typically 19 snowplows working to remove the snow and ice at any one time. If you believe you received a broken windshield due to a county vehicle you need to call (607) 337-1710 and complete an accident report. The County policy regarding damage to mailboxes is such that the County is only responsible for any damage done to mail boxes within the County highway rights-of-way if it is physically hit by a county plow..